DYING OF THE LIGHT was first published by Pocket Books back in the dawn of time (that's 1977 to you young punks), when Jimmy Carter was in the White House, and I was a college journalism instructor with dark brown hair. I had already been writing and publishing science fiction for six years, many of the stories set against the same future history, a very loose background I later named the Thousand Worlds. Novels were long and scary, but I finally decided I was ready to tackle one in 1976. I wrote the entire thing start to finish before giving it to my agent to sell. My title was AFTER THE FESTIVAL. Pocket, after winning the auction against three other publishers, decided that wasn't science fictional enough and made me change it. I didn't mind... much. DYING OF THE LIGHT fit the book just as well. By any title, it was a Thousand Worlds book, probably the culmination of that phase of my career. A melancholy, romantic, elegiac sort of novel it was, but then I was a melancholy romantic myself in those days. It did pretty well. Even made the Hugo ballot that year, losing to Fred Pohl's GATEWAY at Iguanacon II in Phoenix, 1978. The reviews were good too. But don't take my word for it. Subterranean Press has just published a lovely new hardcover of the book, copiously illustrated by the talented Tom Kidd, signed by both of us, and limited to 500 numbered and 26 lettered copies. I hope you will enjoy your visit to my past... and the distant world of Worlorn on the edge of the galaxy, in the far distant future. Just ordered a copy. I have enjoyed the Thousand Worlds from the Tuf perspective and I am excited to read it from another perspective. Some of us dedicated fans have already read it, thank you very much. 1977...is that before or after the dinosaur mass extinction? Will definitely add Dying of the Light to my ever-growing list of George Martin authored or recommended readings along with the recently discovered, Pillars of the Earth. I actually finished Fevre Dream a few months back and immensely enjoyed it. Finally reading A Dance with Dragons and as thousands (millions? (BILLIONS?! ))of people have already confirmed, A Song of Ice and Fire is easily one of the greatest literary accomplishments in modern history. Just super flippin' duper. "Dying of the light" is a very good story, I think. Read it a few years ago and liked it much. was actually the first book I read from you and it induced me to look for more, so no false modesty. I would have liked more from that universe but understand if you concentrate on the Ice and Fire universe. 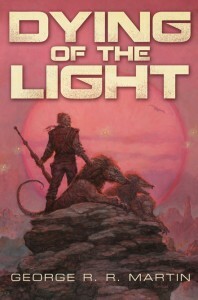 Just wanted to say how much I enjoyed Dying of the Light when I read it. I found it to be a very moving and sad story of love and loss. Such a wonderful novel. Still under the fascination of "a song for Lya" I rushed to read it as soon as it was released (translated in Italian), and I loved it ever since. So glad younger people have the possibility to rediscover it ! This is very good news, George - I still have an old copy of DOTL. An outstanding novel. Years ago I came across some short stories of yours that I think were set in this universe. Have I misremembered, and if not, is there any chance that these might see the light of day again? +1 on the "an outstanding novel"! Wonderful! I've been enjoying discovering your past works. Looking forward to this one! There's a book that stood the test of time. Congratulations! That must be the shipping notice I received from Subterranean yesterday. I've read several of the other Thousand Worlds stories, and look forward to my first read of DotL. Last week also saw the release of the audio book of Dying of the Light, as read by Iain Glen. Posted links here, as there's also Ron Donachie reading Fevre Dream. Alas, it looks like Michelle didn't end up reading Windhaven after all, but Harriet Walter sounds great in the sample at Audible. As Christopher Lee, aka Count Dracula, is Ms Walter's uncle, perhaps she should have read 'Fevre'? (Mr Lee was acquainted with JRRTolkien). I love this book ,just reread it for the billionth time about a fortnight ago.